One of the most iconic venues in all of Manhattan, the Rink at Rockefeller Center Plaza has appeared in countless films, television shows, and photographs, making the Rink an unmistakable symbol of wintery wonder and holiday magic. As a guest of the Lotte New York Palace, you’re just a four-minute walk away from this enchanting NYC attraction. No reservations are required to enjoy a spin on the ice. Just show up, check in, and savor a delicious meal or hot chocolate while you wait your turn. 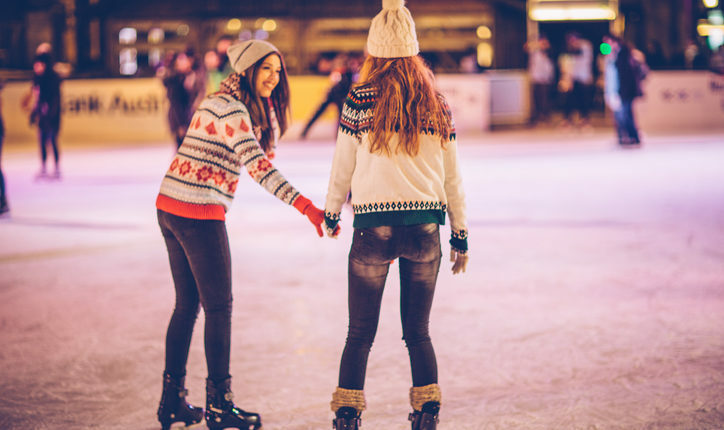 Alternatively, you can call ahead to reserve one of the special skating packages, including Afternoon Tea and Skating, VIP Skate and Dinner at the Sea Grill, Starlight Skate, and many more. Above the rink, an 18-foot golden statue of Prometheus towers, behind him an inscription: “Prometheus, Teacher in Every Art, Brought the Fire That Hath Proved to Mortals a Means to Mighty Ends.” If ever a single sentence could embody the exuberant possibilities of life in the world’s greatest city, that is it. The Lotte New York Palace wishes you and your family an absolutely magical stay in this magnificent metropolis we love.